Developed to obtain the lowest priming volume a range of 4 types of dialyzers for low body weight patients : two sizes are high flux and two low flux. Based on Purema®membrane. The medical products required for haemodialysis treatment, such as dialyzers, bicarbonate cartridges, blood tube systems and infusion and rinsing solutions are developed, produced and marketed by the Serumwerk group. A dialyzer forms part of an extra-corporeal circuit for hemodialysis, the filtering of the blood of patients with renal failure. These devices enable waste products and fluid to be filtered from the blood and into the dialysate, pure water to which precise concentrations of minerals have been added. This process takes place through a semipermeable membrane. 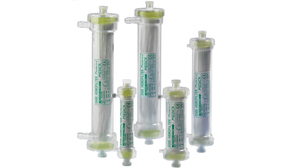 Most dialyzers are hollow-fiber devices made of Helixone®, polycarbonate or polyethersulfone. Others are plate models. Choice will depend primarily on the desired degree of membrane permeability.